This recipe takes a little longer to prepare than some, but it is well worth the effort. Although the meat could be marinated for just an hour, leaving it overnight, or just for a few hours, lets the flavours really mingle. The secret of this dish is to have everything prepared before you start to cook. I used baby tomatoes instead of large ones as I had them in my fridge, and I left my chicken marinating for twenty-four hours to let the flavours infuse. 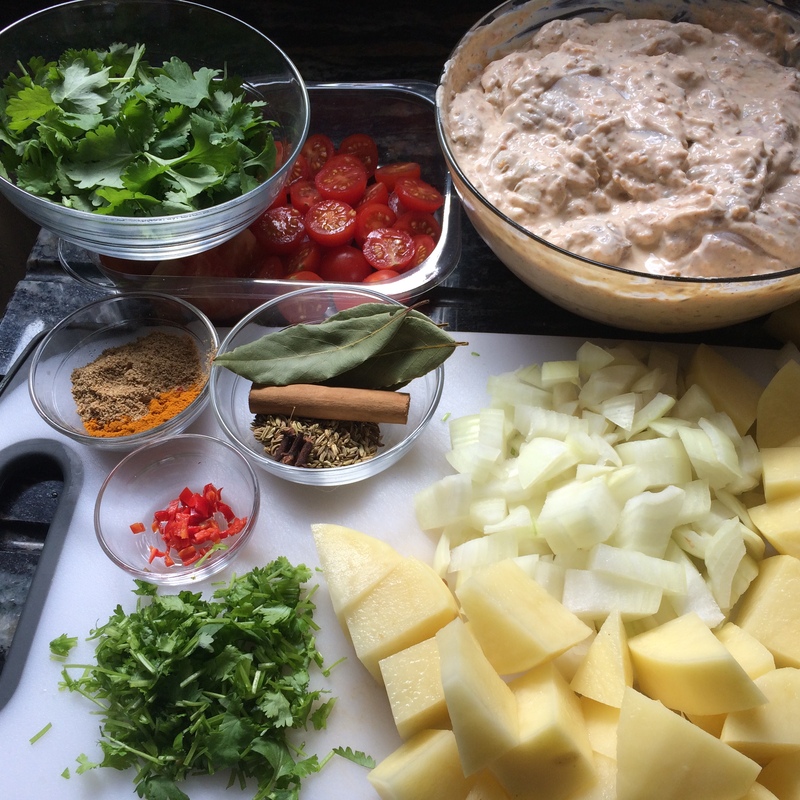 Whilst it is not a ‘hot’ dish, this Nepalese curry is full of delicious flavours and textures. Start by making the marinade. Peel and roughly chop the ginger. Peel the garlic cloves then add to a dry fry pan with the fennel seeds and cardamom pods. Fry for 1 minute on a medium heat then pop into a pestle and mortar along with the chilli powder and a pinch of sea salt. Pound into a rough paste. I cheated here as my pestle and mortar was a little too small to take all of the ingredients so I blitzed them in my Nutribullet. Put the paste into a large bowl with the yoghurt, lemon zest and juice and add the chicken thighs. Stir thoroughly to make sure the chicken is evenly coated. Cover and place in the fridge overnight. Peel and finely chop the onions. Peel and chop the potatoes into rough chunks. Cut the tomatoes into pieces. Remove the leaves from the coriander and set to one side, then finely chop the stalks. Heat 4 tablespoons of oil in a large ovenproof pan then add the cinnamon, cloves, cumin seeds and bay leaves. Add the chicken in a single layer and cook for at least five minutes on one side, until you have a lovely golden crust. Stir in the ground spices, then add the onions, potatoes, tomatoes and coriander stalks. Turn the chicken over and cook for another 5 to 10 minutes or until browned all over. Pour over 350ml cold water and bring to the boil. Place the pan in the hot oven and cook for about 1 hour uncovered, or until the chicken is cooked through and tender. Stir occasionally. Remove the cinnamon and bay leaves. Sprinkle with the coriander leaves and finely chopped red chilli. Serve with rice and a bowl of plain yoghurt. This recipe serves 8 people (or 4 very hungry ones). I have frozen the remainder for future use as there was only two of us. 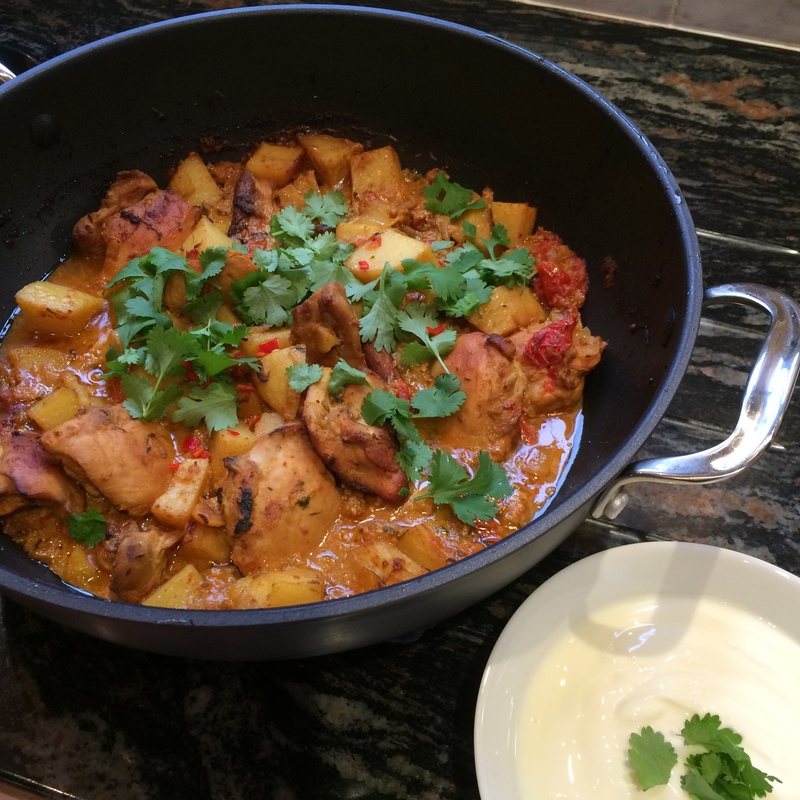 This entry was posted in Dinner and tagged Chicken, Chilli, Curry, Dinner, Ginger, Gluten Free, Healthy Eating, Potatoes, Probiotic Yoghurt, Supper, Tomatoes. Bookmark the permalink.